[John's father, Zechariah, continues his prophecy:] "And you, my little son, will be called the prophet of the Most High, because you will prepare the way for the Lord. You will tell his people how to find salvation through forgiveness of their sins. Because of God's tender mercy, the morning light from heaven is about to break upon us, to give light to those who sit in darkness and in the shadow of death, and to guide us to the path of peace." At first glance, this is a passage about great expectations that parents have for their child. 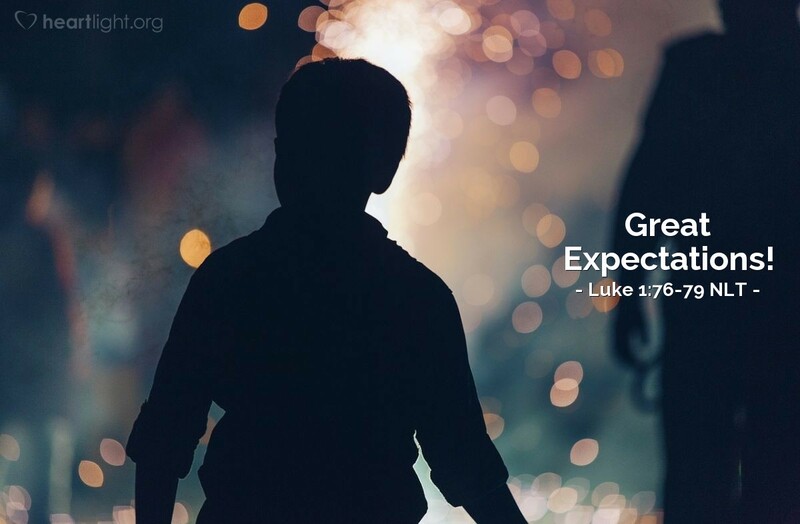 However, on closer inspection, it is really about the great expectations that people have for God. The birth of John was the dawn of God's great time of fulfillment. Many of the promises to the people of God, spoken over centuries in the Old Testament, were now coming true. John would be a tool in God's hand. John would be a sign that the time of fulfillment has come. John would be a servant to the Almighty. However, the work is God's work. The deliverance is God's salvation. The triumph is God's victory. The fulfillment is God's faithfulness. The dawn is here, and darkness is being driven away by a holy light. Father, I praise you for being completely faithful to your promises. I thank you for using everyday human beings to be your vessels through whom your work is done. I appreciate you for choosing Zechariah and Elizabeth to receive your miraculous blessing of John. I honor you for loving your people and bringing them hope in their night of despair. I am in awe that the fulfillment of the promise of the gospel began with John the Baptist. Thank you for your plan to bring us salvation. In Jesus' name, I pray. Amen.